During last night’s imaging session, I got to try out a feature that I’ve wondered about since I started using SkySafari. One thing i always had trouble with previously was visualising exactly what I would be able to fit into the field of view of the DSLR sensor on the 1100D. Very often, targets were disappointingly small, or overwhelmingly large for the sensor. Other times, the size would be right, but the framing would be out, and I’d cut off fainter parts of the object that I couldn’t see, even on test sub-frames. SkySafari comes with a tool that allows you to set up the reticle that appears in the middle of the screen by defining your different equipment, from scopes, to camera sensors and eyepieces. You can then define combinations of this equipment. For example, I may want to have a rectangle that shows the field of view of my Canon EOS 1100D DSLR sensor when attached to my 80mm f/6 refractor, Or of my Toucam when used with my 200p f/6 Newt and the 2x Barlow, etc, etc. you define the equipment you have under the ‘Equipment’ options page and then put together combinations of this equipment in the ‘Display’ options page. Display Setup – Put together combinations of scopes, sensors etc. Once you’ve defined these combinations, you can turn the reticles off and on at will in the Display options. Normally these reticles are only shown when you’re connected to a telescope, but. 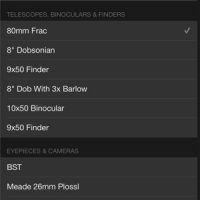 You can also enable them at all times for planning and testing purposes by selecting ‘Show even if not connected to telescope’ in the Display options. The screen image to the left shows the setup I have which shows me the field of view when using the 1100D through the 80mm f/6 refractor. I’ve lined this up to the field of view I was imaging in last nights session. Next to this I have superimposed the actual image I took last night, uncropped. As you can see, the preview that SkySafari gave exactly matched what I got. The only other thing you have to do is to match the field rotation of your DSLR by altering this in the Display settings in Skysafari. This will depend on what you’re imaging at the time, and the frame composition you want. 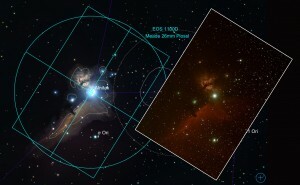 Most of the time you need to line up the frame by using the bright stars in live view mode, as the object itself will be too dim to be displayed live. However, once you’ve had a bit of practice at this, it’s not too hard. 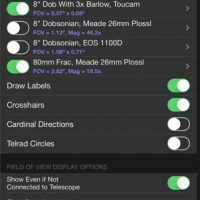 The upshot of all this is that you can check to see what will be worthwhile targets with particular combinations of imaging kit, saving you time in the field. Anything that saves time that you can then use for imaging is worth it in my opinion! The final step I use is to save the potential targets to an observing list. You can either use the default ‘Favourites’ list, or create another list under the ‘search’ section in SkySafari. To save an object to a list, select the object on the chart, and click the ‘Info’ button. On the info page, you have an ‘Observe’ button. 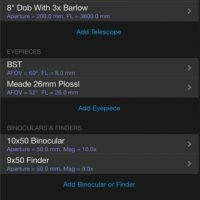 pressing this allows you to add the object to any of your observing lists. To recall an object, simply select the observing list in the ‘search’ page on Skysafari, then select the object. If you are connected to a scope, you can even slew directly to it from the object’s info page.